The Ocean City Nor'easters pride themselves as a soccer club that features bright, young talent with a tremendous future ahead of them. This same approach applies to the club's selection of the singer of the national anthem. The Nor'easters are proud to announce that Olivia Currier, a 13-year-old Philadelphia native, will be the club's primary national anthem singer for the 2018 season. Currier, who spends her summers at nearby Longport, N.J., will make her season debut at the team's home opener on Sunday, June 3 against the Long Island Rough Riders. Kickoff at Carey Stadium ("The Beach House") in Ocean City is scheduled for 7 p.m. While just 13, Currier already has an impressive singing resume. She has sung the national anthem for several teams both at major colleges (Villanova, University of Pennsylvania) and four of the five major sports including the NFL (Philadelphia Eagles), the NBA (Philadelphia 76ers, Boston Celtics, Orlando Magic), the NHL (Carolina Hurricanes), and Major League Soccer (Philadelphia Union). Later this year, she will add Major League Baseball to her resume as she is scheduled to sing for the Pittsburgh Pirates on Sept. 22. Last year, she sang the anthem for the last four home game for the Nor'easters. For Currier, she's more than comfortable performing in front of crowds. 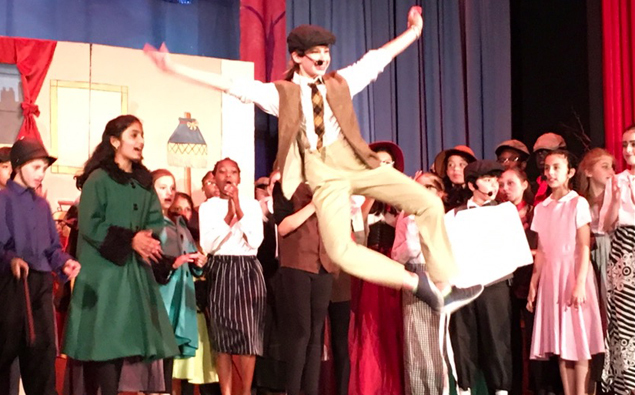 Olivia Currier plays the role of Bert in a production of "Mary Poppins"
Currier's dream of performing on stage started very early on. She takes musical theater and acting classes at the Walnut Street Theatre in Philadelphia. She also participates in her school musicals, where she recently starred as Bert in a production of Mary Poppins. "Olivia started singing at the age of five in musical theater," said Olivia's mother Lori Currier. "She has always loved singing and acting from a very young age. She really relishes the spotlight." Currier will be singing the national anthem at all Ocean City home games this year with the exception of the June 20 game against Reading United AC. For Currier, being able to sing the national anthem at sporting events has been a tremendous learning experience. “Singing in front of thousands of fans has allowed me to learn the value of preparation," said Currier. "And that attention to detail really gives me the confidence and poise I need to perform." Check out the video below to see Olivia Currier perform at a Philadelphia Union game and a Philadelphia Eagles game.